There’s a small pitcher plant (not sure what it was) to the left of the plant you like. That’s the one I lost. In the summer they sit outside in full sun. I live in Delaware we have hot humid weather in the summer. After finding out the hard way how much peat compacts I always let my unplanted pots sit out in a few good downpours first. Then top it off with more peat and my plants. 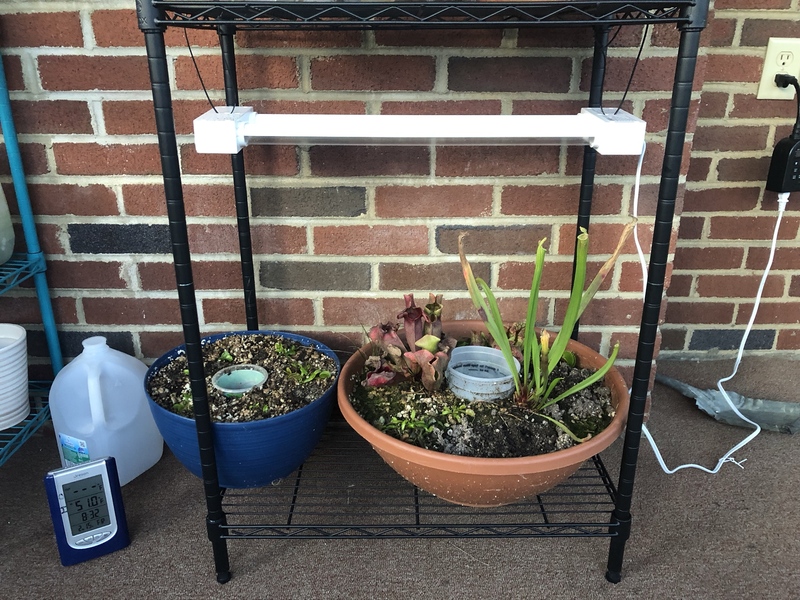 You leave bog gardens outside, just like any other potted flytrap. As long as the media doesn't freeze solid for longer than a day or so, they'll be fine. The only issue you can have is if the media freezes and they can't drink any water. A bog garden is treated the same as a potted flytrap, it's just bigger. Fishkeeper wrote: You leave bog gardens outside, just like any other potted flytrap. As long as the media doesn't freeze solid for longer than a day or so, they'll be fine. The only issue you can have is if the media freezes and they can't drink any water. My local Lowes had several flytraps on the shelf last spring, bought the only two that wasn't completely dead. By fall they seemed to be healthy enough to survive substrate change & repotting, neither trap seemed to go fully dormant. They didn't grow much this winter but they didn't fully die back either. Each plant kept several green traps and caught quite a few small bugs over the months. Over the last few weeks they've all but exploded. It was quite amazing actually, both plants started growing flower buds on the same day. They've almost doubled the number of traps they had just a month ago, the traps are easily three times the size they had before, and both have grown rhizomes & started new plants. Klikmaus wrote: My local Lowes had several flytraps on the shelf last spring, bought the only two that wasn't completely dead. By fall they seemed to be healthy enough to survive substrate change & repotting, neither trap seemed to go fully dormant. They didn't grow much this winter but they didn't fully die back either. Each plant kept several green traps and caught quite a few small bugs over the months.